Representing and plotting a distance in F1/F2 graph, in terms of the Euclidean distance, is relatively easy in R. This post shows one of the ways of achieving that. 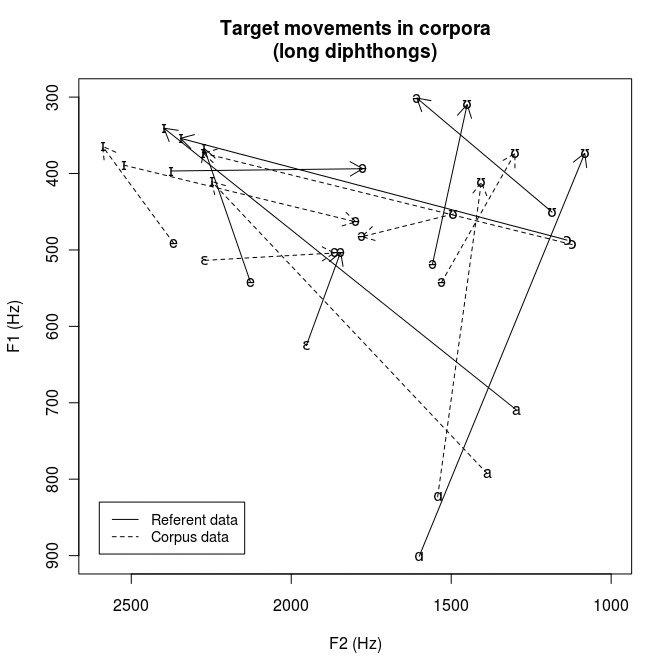 First, we provide a sample data, which consists of F1 and F2 values for two diphthong targets. Then, draw the diphthong positions with their starting and ending targets, and, finally, calculate the distance. This R code does most of the F1/F2 calculations and drawing. These are the values for the first two formants in /ɑʊ/, as measured in a group of 15 female ESL student and one RP speaker (also female). Number 1 in the notation marks the first vowel target, 2 the second (thus, aw_l_1 is /ɑ/ and aw_l_2 is /ʊ/), while the “l” marks a long diphthong. The two targets will be the starting and the ending of a line, and the line’s length is expressed by the Euclidean distance. Our Cartesian coordinate system is defined by F2 and F1 axes (where F1 is y-axis), and the metric distance refers to the distance from one diphthong target to another. The vowel targets, corresponding to A and B points are defined by the F1/F2 values in Hertz for a particular vowel. In our example above, A and B are rows 1 and 2, while the values are F2 and F1 frequencies. Drawing the F1/F2 “coordinate system”. Drawing the vowels in A and B positions, and connecting them with a line. Drawing the arrows showing the direction of pronunciation and placing the IPA symbols. The English diphthongs as pronounced by the ESL students and a native RP speaker. The R code used to plot the graph can be found here. How could we modify the script to add a third measurement point? Namely, at 25%, 50% and 75% of the vowel duration? Yes, of course 🙂 It’s a code/script and very easy to modify. thanks for your post. It is really interesting. /ɑʊ/. What was your criteria of dividing /ɑ/ from /ʊ/? Did you manually, looking spectrum and formants and hearing sound file, divide each vowel from each speakers?